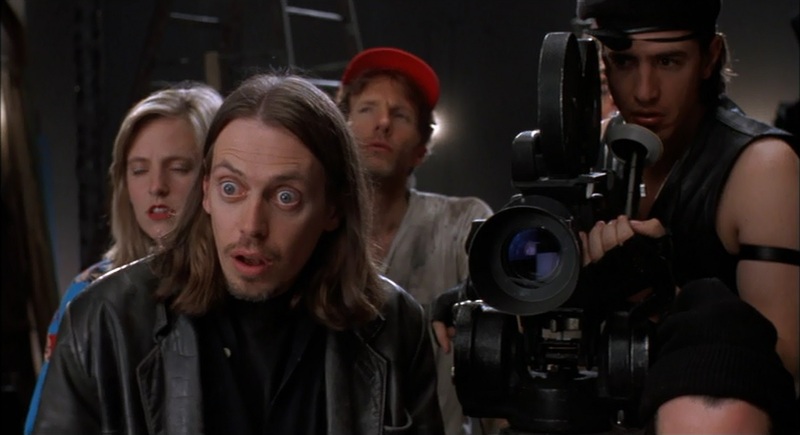 With technology promoting the supposed democratization of media, particularly film, it's already easy to forget what a big deal the surge in independent film represented in the 1990s. It was a glorious time, when the rise of Tarantino heralded an age of risk-taking in terms of narrative and dialogue, when the Weinstein brothers were snapping up any little movie that got a bit of acclaim in the hope of developing the next big talent, when the Sundance Film Festival had the attention of Hollywood buyers offering insanely lucrative deals to people who a few months before might have been struggling to play rent. It was a time when anyone who could get their hands on a 16mm camera and a few friends endeavored to put their stories on film. But of course, anyone who has ever spent a day working on any cinematic endeavor, whether it's a no-budget short film or a multi-million-dollar Hollywood production, knows that an art depending on the contributions of so many people has that much more potential to go wrong. There will be delays, mistakes, cost overruns, and a myriad of frustrations that threaten to derail a filmmaker's vision. Director Tom DiCillo had already encountered many of these agonies while making his debut film Johnny Suede in 1991 and found the finished product didn't live up to his concept. He shrewdly decided to not let the experience go to waste, turning these problems into a short script about one really bad day on the set of a low-budget film. When the script proved too long to make a short from, he fleshed it out into what would become Living in Oblivion, a charmingly nostalgic glimpse of the less glamorous aspects of pre-digital filmmaking and the stress, turmoil and fleeting moments of creative joy to be found on a film set. The film is structured as three separate vignettes, each existing in its own level of reality, that chronicle the efforts of independent auteur Nick Reve (Steve Buscemi) to capture three distinctly different scenes for his highly personal film, also titled Living in Oblivion. Common to each story is insecure actress Nicole Springer (Catherine Keener), who's best known for appearing in a shower scene in a Richard Gere movie and is battling the self-doubts that inhibit her from grasping her character. There's also the motley film crew, which includes leather-clad and eye-patched cinematographer Wolf (Dermot Mulroney), his combative girlfriend and first assistant director Wanda (Danielle von Zerneck), and a mix of lighting, sound and camera technicians of varying levels of competence. The original short script forms the basis of the first vignette, in which Reve tries to get a very emotional scene in one elaborately-staged shot, and it does feel like a very accurate pastiche of the kind of day-to-day problems a film crew might encounter. Each take is spoiled by such random inconveniences as the boom mike dipping into frame, location noises interrupting the scene or actors missing their cues, each of which pushes an increasingly frustrated Nick closer to the breaking point. Buscemi is perfectly cast not only because of his acting talent but because he did come to serve as the thespian face of independent films of the decade, working with the Coen brothers, Tarantino, Alexandre Rockwell, Robert Rodriguez and others before becoming a director himself. With his leather jacket and grunge rocker hairstyle, he perfectly captures the director-as-star mentality of the period, when filmmakers were thinking about how they'd package themselves before they even completed their first movie. He also conveys the toll that massaging the egos of actors and keeping everyone in a positive mindset can take on a director's stress level. DiCillo had allegedly written the short to serve as a showcase for Keener, who had appeared in his previous film. As Wolf comments in one scene, she owns the frame. Keener not only succeeds in creating an endearing character as Nicole but is equally convincing when playing Nicole's in-film character. The multiple takes she gives delivering a heavy monologue about a traumatic childhood incident highlight the struggle actors face to keep up their energy as Nicole's growing frustration and boredom creep into her performance, causing her emotional dialogue readings to flatten into an annoyed monotone. The second and possibly funniest segment involves the film crew's day with big-name actor Chad Palomino (James LeGros), whose star presence promises some credibility to the tiny production but comes with a whole new set of problems since Chad is eager to contribute to every aspect of the shoot. He also uses the day's filming to passive-aggressively sabotage Nicole, with whom he's had a quick fling the previous night. LeGros is a familiar face in independent film himself, though he will forever be known in my household as Mr. Sensitive Pony-Tail Man following his appearance in Singles. His performance as Chad feels so authentic in its ridiculousness that it spawned an urban legend regarding just who exactly the character is based on. 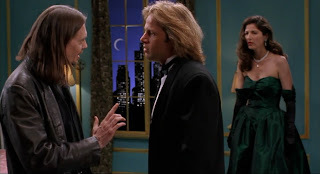 Since Brad Pitt had starred in Johnny Suede and DiCillo hads acknowledged the problems he had in that film, most assumed it was supposed to be Pitt. DiCillo has since denied this and insists that he had actually intended for Pitt to play the part. He also suggests that LeGros had based Chad's mannerisms and attitude on a big star he had worked with not long before, which has led many to hypothesize that Chad borrows a lot from Patrick Swayze, whom LeGros had previously starred in Point Break with. Wherever he comes from, Palomino is a perfect portrait of Hollywood ego run amuck. Initially he seems supportive and enthusiastic, expressing disdain for the big-budget films that fuel his stardom and claiming he prefers the raw art of independent films. It quickly becomes he's really a self-serving hypocrite who's only signed onto Nick's film because he knows he can throw his weight around and control the production. We watch in both horror and amusement as Nick struggles to preserve his conception for the scene being filmed while Chad's inane suggestions mutilate the blocking of it, allowing Chad to edge closer and closer to camera until the frame is filled with him smugly preening. The final segment has Nick attempting to shoot a surreal dream scene amidst a malfunctioning fog machine, a tetchy dwarf actor (Peter Dinklage in his screen debut), Wolf's emotional breakdown and the sudden appearance of his dementia-addled mother on the set. 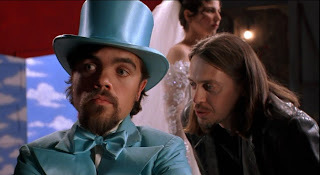 It's almost impossible to discuss this portion of the film without heaping praise on Dinklage. While he doesn't have a huge amount of screen time, he immediately proves himself a master of the slow-burn, responding to Nick's instructions with a stubborn lack of cooperation stemming from his own personal (and not unfounded) objections to the nature of the scene. Dinklage commands our attention even when he's just loitering in the background, silently communicating his disbelief at the incompetence of the crew. We can already see hints of the weary annoyance he would bring to his breakthough role of Finbar McBride in The Station Agent (an inevitable future installment of this series) as well as the caustic brilliance of Tyrion Lannister. Credit also has to go to Dermot Mulroney as Wolf. Before seeing this, he had also earned a nickname in my household, though in his case it was the less complimentary moniker of 'Urine Stain' owing to a particularly unfortunate line reading he had given in a previous film. So I was pretty shocked at how funny and endearing he is here. Each segment gives us a different side of Wolf, from his full-on pretension in the first segment, his jealously indignant hostility toward Chad in the second, and finally a surprisingly sensitive side as his relationship with Wanda hits the rocks. Yet despite his quirks and occasional combativeness, Wolf seems to be the member of the crew who is the most professional at his craft, as his instincts for what best serves the film he's making are proven to be pretty sharp. Given the focus on dream sequences, this is also a good time to note the film's unorthodox structure, as each separate story is revealed to be a dream had by one of the characters that hints at their deep insecurities and desires. It's a nice reminder that filmmaking itself can be considered a controlled, collaborative form of dreaming, one that can also reveals concealed or even unconscious truths if it's being done right. The divide between reality and dream is also visualized by the use of color and black-and-white throughout the film and the way common story elements and actors bleed through the stories in different contexts. Oh, there's also the fact that the name 'Reve' means 'dream' in French. The last segment also beautifully captures that rare, magical moment in filmmaking that occurs after all one's grand plans fall apart and all one's preparations are spoiled by circumstance. Amidst such moments of despair, sometimes the most unexpected thing will happen that can bring a scene to life in a way that can't be scripted or choreographed. 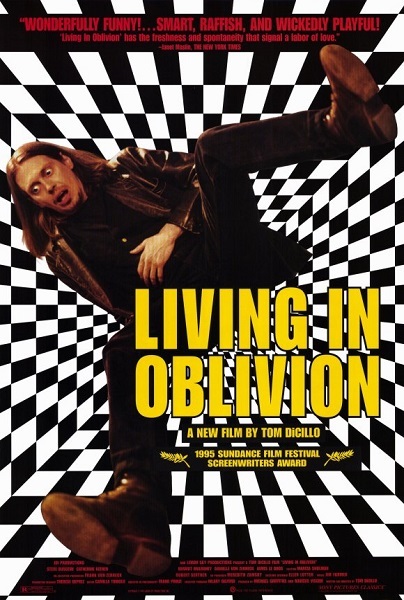 Living in Oblivion suggests that despite the headaches, turmoil and frustrations it takes, getting that brief instant of transcendence burnt onto celluloid is worth every hilarious hardship. I now the feeling of writing a great review (well, your review is great anyway) and baiting some discussion and nothing comes of it. Wonder why the hell I blog at times. Great review and I am preparing on myself at my site. I liked it more than Johnny Suede really though that was a nice little slice of 90's Indie film making as well. Going over a few moere reviews before I sort out what I want to say, but it won't be this good. Thanks! It can be frustrating but I can only hope (and I hope you do as well) that if you continue to plug away at it, people will show up and start talking eventually. I actually haven't checked out Johnny Suede yet, or a great deal of DiCillo's work but it's on my list of things to get to. Hope to check out your blog soon as well.